Last Thursday I visited the Daley Plaza Farmer's Market over lunch and came away with quite a haul: Heirloom tomatoes, purple bell peppers, sunflowers, fresh basil, smoked string cheese, a LaBriola whole grain loaf and a beautiful selection of potatoes. 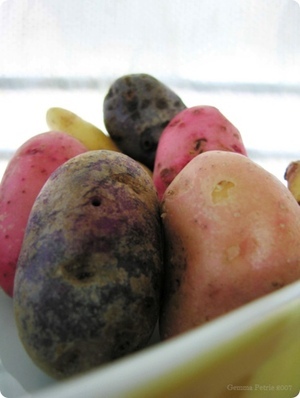 These pretty yellow, red and purple potato varieties came from Nichols Farm & Orchard. This family run farm is from Marengo, Illinois -- quite near where I grew up. They sell their produce at several farmer's markets in the Chicagoland area. I'm a sucker for the $5 cookbooks that can be found in piles near the register in bookstores, especially when they cover a finite topic. A few months ago I purchased Potatoes by Annie Nichols and decided to try one of her recipes. Place two chopsticks on either side of a potato and make crosswise cuts about 1/4 inch apart. The potatoes will fan open as they cook, but you want the base of the potato to remain intact so they will not fall apart. Insert whole or partial bay leaves between a few of the cuts and repeat with the remaining potatoes. Melt the butter with the olive oil in a cast-iron skillet or roasting pan over moderate heat. Add the garlic and the potatoes in a single layer. Gently move the potatoes around for about 5 minutes. Remove from heat and generously salt and pepper. Place in the preheated oven for about 30 minutes, or until the potatoes are golden brown and tender. 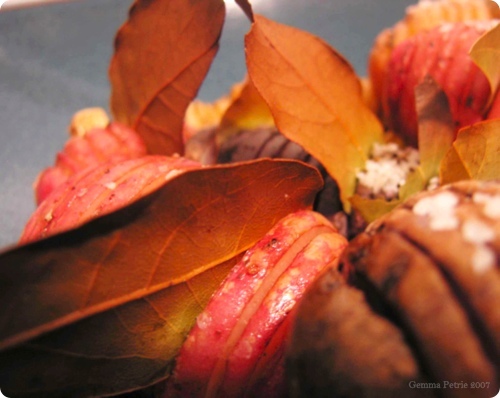 This simple method of roasting potatoes produced very delicate and colorful results. You could substitute any fresh herbs for the bay leaves. My favorite herb to use with potatoes is fresh rosemary, and that is what I will use with this recipe in the future. That's so pretty! 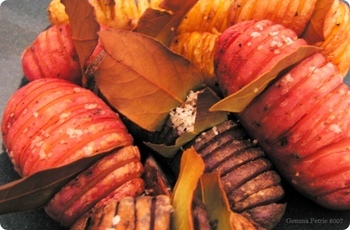 I love hasselback potatoes and using the brightly colored ones is a great idea. Wow, Gemma! These sound delicious--and the chopsticks are an ingenious way to control the potatoes as you cut them. I agree about rosemary being fabulous on potatoes. ohhh my gosh i just bought the same potatoes today. i'm gearing up for some after-work-experimenting! and yes, we should cook together sometime. i moved but still live in logan square. i have been seriously longing for soups and breads...and fall. That is a very beautiful way to cook potatoes. The color of the images is quite striking as well. Awesome presentation with the leaves... I have to try that sometimes. 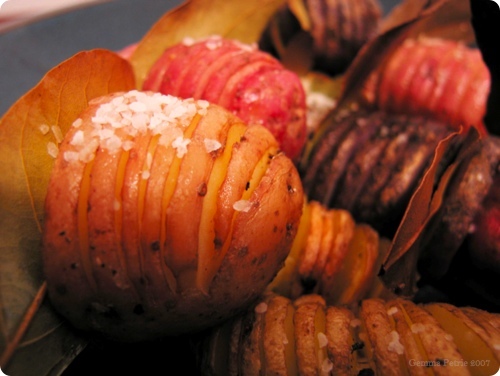 It's funny, I've prepared potatoes this way forever (it was a family thing, usually in summer cooked on the grill in foil packets rather than stove and oven), but I never knew that they were called hasselback potatoes. And I have to agree that potatoes with garlic and rosemary are tough to beat.